Guess WHO's gotta NEW dew? SOUTHERN RACKS that's who! Southern Racks has a brand new look for our outdoor product line up! A great new look, and the same professional salon style formulas! Available NOW! 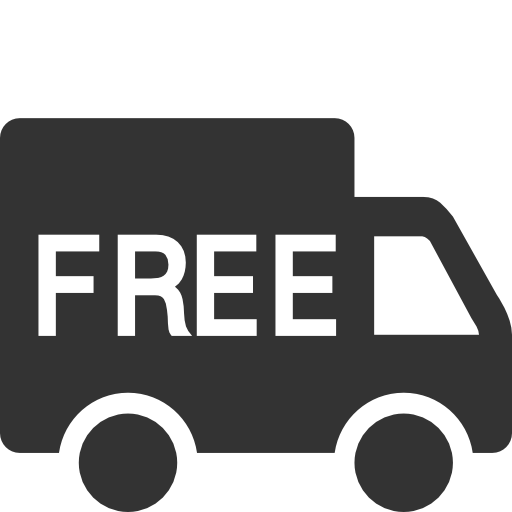 Men’s 3 in 1 scent free product contains shampoo, conditioner and body wash all in one bottle. 3 in 1 is full of moisturizers and conditioners that will retain and replenish the moisture in your skin, even in cold weather conditions. 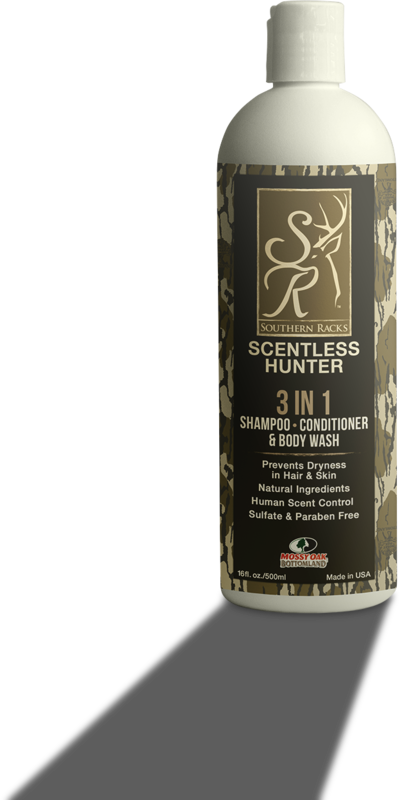 Professionally designed for women hunters, our natural, scent free, volumizing shampoo, adds volume and leaves your hair soft and manageable without the frizz. Professionally designed for women hunters, our natural, scent free, moisturizing conditioner, improves body, texture, and strength while soothing hair and scalp. Southern Racks moisturizing body wash is natural, scent free, and gently cleanses as it moisturizes and conditions while restoring moisture loss to the skin. 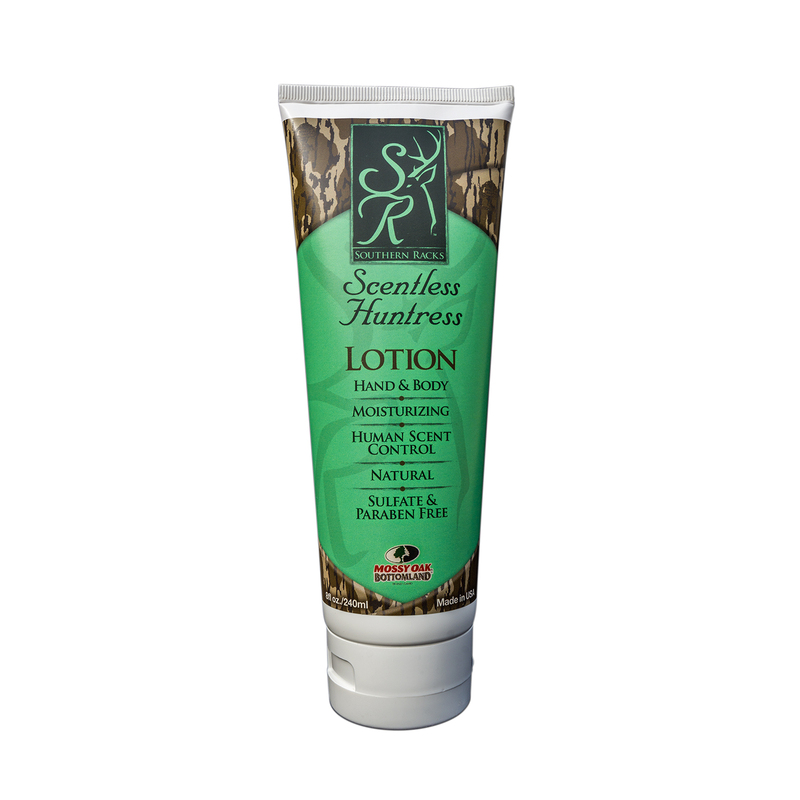 Southern Racks hand and body lotion is natural, scent free, and contains antioxidants that retain moisture, and defend against aging! 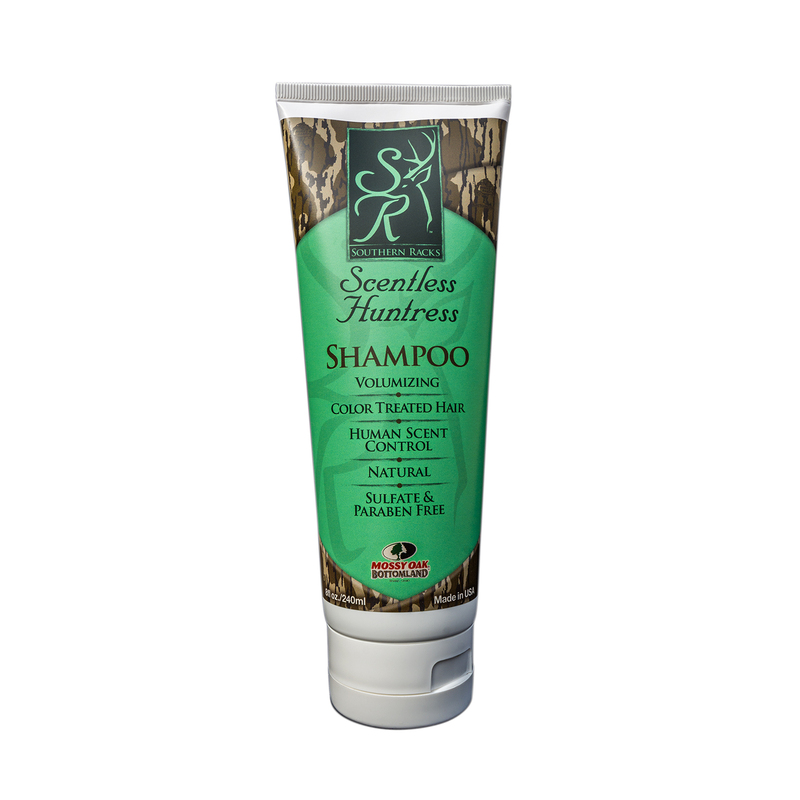 Southern Racks shampoo, conditioner, body wash and lotion products are scent-free, natural, and professionally made for women hunters. Our volumizing shampoo and hydrating conditioner contain vitamins, minerals and antioxidants, and are safe for color-treated hair. Southern Racks Body Wash and Lotion contains anti-irritants that sooth sensitive skin and skin conditions such as eczema or psoriasis. Safe for skin conditions such as psoriasis or eczema or sensitivity to scents. Recent studies have found Sulfate is toxic and carcinogenic. Sulfate may cause hair loss, destroys hair follicles, and inhibits hair growth. 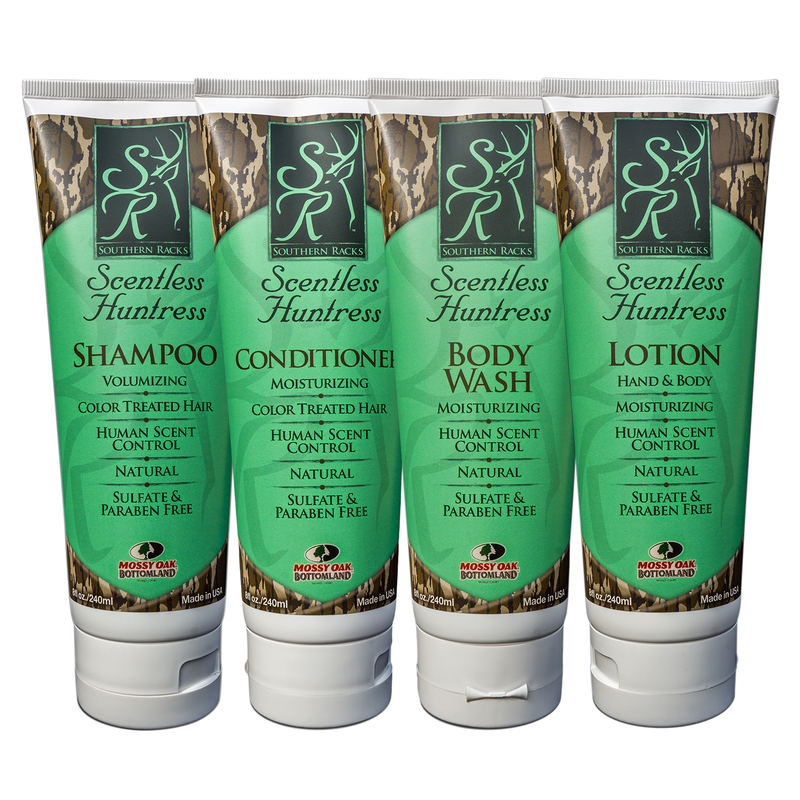 Our scent free products are professionally designed for a huntress or hunter. Parabens are preservatives used to prevent the growth of bacteria and fungus, and are known to cause allergic reactions and irritate some skin conditions. Southern Racks outdoor products have a great new look coming featuring the brand you know, wrapped in the original Mossy Oak Bottomland camo you love!! Get the latest scoop on Southern Racks & Mossy Oak! SAVE 30% on CLEARANCE PRODUCTS! 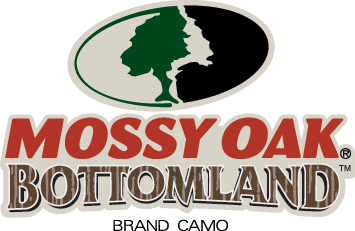 We’re making room for our new Southern Racks outdoor products featuring Mossy Oak Bottomland! Same great formulas NOW 30% OFF!